People with diabetes are at increased risk of serious health complications. 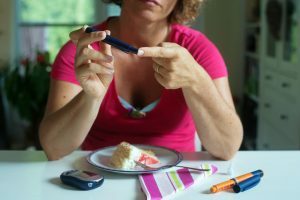 The daily life of a diabetic includes testing one’s blood sugar, taking medication (about 25 percent will eventually need to add insulin injections) and monitoring diet. Diabetics also are encouraged to exercise. More than 1 in 3 American adults – approximately 84 million – have prediabetes. About 70% of people with prediabetes will develop type 2 diabetes. That’s why everyone involved is motivated to better identify, manage, engage and educate not only people already diagnosed with diabetes but also everyone at risk of becoming diabetic. Patients with a diagnosis of metabolic syndrome – commonly referred to as prediabetes – are one of the cohorts of rising-risk patients everyone wants to identify as early as possible and then engage them in their health to prevent progression to chronic illness. This is quite the challenge given that the overwhelming majority (90%) of prediabetics do not know they have it. Earlier identification and management of rising-risk patients is one of the primary reasons payers, physicians and employers are increasingly using a shared analytics solution. Predictive analytical models are able to identify which cohorts of people are likely to become sick in the next 12 to 24 months. But perhaps more importantly, it allows those who interact with and care for prediabetic patients to easily collaborate and align around shared goals and purpose, effectively intervening and engaging patients in a way that improves outcomes and quality of life. The convergence of payers, providers and employers means greater alignment, collaboration and personalized, patient-centered care that improves the health, satisfaction and quality of life of patients like Lucy. Meet Lucy*. She is 42, a mother of two teenagers and a part-time caregiver for her elderly father. Through her employer, Lightning Laser, Lucy has been insured by Allegiant Health Plan for the past three years. In the year since her diagnosis, a number of people have been working with her and behind the scenes to help prevent her from progressing to diabetes. All of these people are using a shared analytics and insights platform to enhance their individual and collective effectiveness. Lucy’s primary care physician is Dr. Todd Becker. For the past 10 years, Dr. Becker has been a part of Granite Physicians. The practice has a value-based contract with Allegiant Health that incents Dr. Becker and his colleagues to complete and improve HEDIS® measures such as measuring BMI, checking blood pressure and ordering fasting blood glucose tests for adult patients. Since Lucy’s diagnosis, Dr. Becker and his team have used the analytics platform to monitor her progress on her care plan, including annual measurement of her BMI and nutritional counseling. Lucy’s referral to Allegiant’s health education program was done within the platform. Three years ago, Allegiant licensed an analytics platform to, in part, support Jaime’s work. As a result, Jaime has been able to undertake efforts to identify subpopulations of members with gaps in care, many of whom also are the plan’s rising-risk patients. For example, she reviewed BMI trends to generate lists of members at risk for or with a metabolic syndrome diagnosis, which were then shared with Allegiant’s value-based care practices. Granite Physicians’ list from 15 months ago included Lucy. Until a year ago, Judy was a disease manager for Lucy’s health plan, Allegiant. Traditionally, her plan’s care management program focused on chronically-ill and catastrophically-ill members. The plan’s increasing emphasis on value-based care and managing the population rather than just the sickest of the sick, means care managers – now called population health clinicians – have an expanded role that includes identifying and engaging rising-risk patients and improving key HEDIS® quality measures in the plan’s value-based contracts. Judy is Lucy’s population health clinician. Using the analytics platform, Judy is able to monitor Lucy’s progress on her care plan. By viewing Lucy’s record in the platform, Judy knows her health education colleague has already reached out to Lucy and enrolled her in the right program. When Judy contacts Lucy, she affirms her participation and answers her questions about metabolic syndrome treatment and prognosis. Lucy’s employer is Lightning Laser. The vice of human resources, Chase, has been using the analytics platform for the past three years. At the outset, he focused on out-of-network utilization and preventable emergency department visits. More recently, he has used the platform to identify cohorts of rising-risk employees and learned a sizeable percentage of his employees has diabetes and an even greater percentage has prediabetes or is at-risk for prediabetes. Armed with this information, Chase has been working with Allegiant Health Plan to offer virtual health education and nutritional counseling programs, one of which included Lucy, and semi-annual onsite biometric screenings of BMI, fasting and non-fasting blood glucose, blood pressure and more. Lucy was able to take advantage of the onsite biometric screening this year. Her biometric information was uploaded to the analytics platform so the professionals monitoring her care plan know she is still on track. I know firsthand those of us who work in healthcare have always wanted to help Lucy and others like her be one of the 30 percent of prediabetics who do not progress to diabetes. For the first time, all of the people who interact with Lucy and have the opportunity to help her adopt a healthier lifestyle and engage in her health – her physician and his team, the population health clinician and HEDIS® director at her health plan, and her employer – have a tool that simplifies collaboration and coordination in a way that directly benefits Lucy. The convergence of payers, providers and employers means greater alignment, collaboration and personalized, patient-centered care that improves the health, satisfaction and quality of life of patients like Lucy. This post was originally written as the third in a series of sponsored guest blog posts on our Convergence conference blog.